Been over a year since I've updated my site. With all the next gen consoles out and a crazy number of high quality PC titles to play there's not enough time for anything these days, nevermind update my site. I probably won't be updating it anymore except for portfolio and review scores just to log which games I've actually passed. My backlog queue of games is probably around 10 years, so I really should get on that. ;-) I won't be writing any long and fancy reviews anymore either. It was fun when I was a student and had 50 hours a week to play around with games, but that's not reality anymore. If anyone found their way here because they're looking to recruit an artist or designer for a new project the only thing I can point out as of this update is that everything in the portfolio section is student created work. I have yet to update that section with any screenshots from God of War II or the currently unannounced project that we're working on at SCEA Santa Monica. ;) All the game reviews are pretty old, the resume is way out of date and once again portfolio is simply student work, no professional stuff. The contact information is still up to date. If you need to get in touch, feel free to do so. If your last name is Palamarchuk and that's why you came to this site, send me an email! I can set you up with a free yourName@palamarchuk.com email. 100% safe and secure. I simply tell my server to forward all email to your real email address. I've had many people from Ukraine email me and ask about this. It takes me less than 5 minutes to set up your account and you will have it free for life. · Graduating in less than a week! If you're a recruiter checking out my site for the portfolio, click HERE for the goods. June/06 Demo Reel - 52mb, 3 minutes long, Windows Media Player with DivX codec required. DivX codec can be downloaded free at www.divx.com. 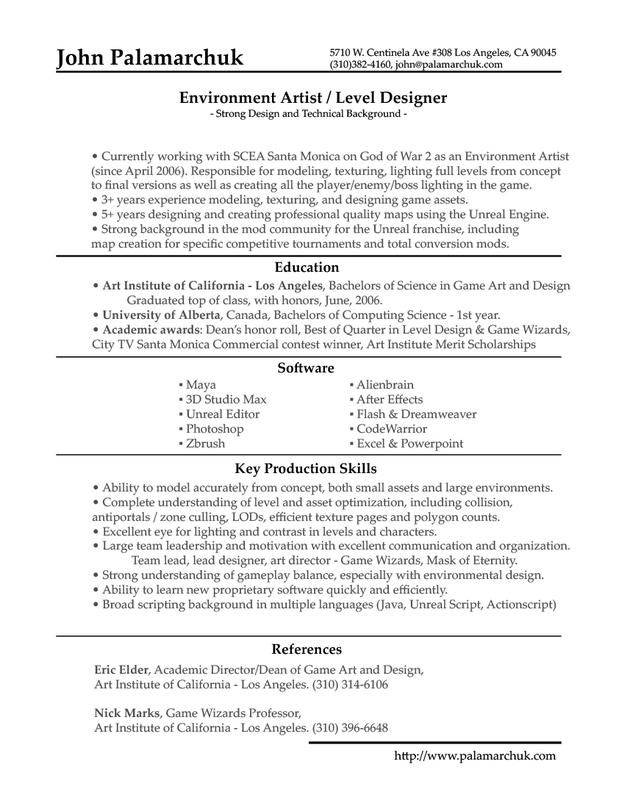 The resume page is now completely up to date. Please click 'resume' on the left to go directly to my latest version. I'd also like to congratulate the Game Wizards production team on the completion of the Monster Smash game! This project proved to be a massive success even when there were so many times we all felt it could flop any second. It was only a couple weeks ago that we all felt we would never live up to expectations or our high hopes for creating the best Game Wizards project ever. I can't wait to see future Game Wizards generations try to top this game! · Huge updates just in time for GDC (Game Developers Conference) with a full resume update, expanded portfolio page, map additions and more. Attending GDC? Let's meet up! You can get my contact at the Art Institute booth. :) I am currently seeking an internship starting in the new couple weeks as well as starting to look for job opportunities as I graduate in 3 months. On a side note, congrats to Bethesda on Oblivion's release today! Shame we all have to wait until after GDC to enjoy it! · Spent a few hours updating the Portfolio page. 3 new map info pages, with full screenshots and download links of the maps are now available. Also available on the portfolio page is a link to my Mortal Pongbat flash game and Nakatsuru District poster. Some really high quality content posted today so check it out if you have a few minutes! ;) I recommend starting with this. Also be sure to check out the Alpha release of one of the mods I'm currently working on. Right now I'm overseeing all the map production and making sure each map is up to the polish level that any Epic retail map has. 3-4 maps that I have created will also be included in the final release of the mod. It is a total conversion mod for UT2004 which is a remake of the original Unreal Tournament. The Alpha is going to be released in the next day or so. Head on to www.getutr.com for more info! · Starting work on a 2.0 version of the site. It should be complete or near complete in the next few days. Until then I hope you're enjoying the recently released Xbox 360, since it's so awesome. Ironically enough I've been spending the most time with the classic Xbox Live Arcade games than the 3 launch titles I purchased (Kameo, PGR3, PD0). This thing is basically a sleak, powerful PC, and I'm lovin it! · A nice update for fans of my Unreal Tournament 2004 clan/team. A few hours were spent finding, sorting, compressing and logging all our UT2004 matches. I'm sure a few were missed (because I missed one match every once in awhile), though I would guess 95% of them are there and accounted for. Quite an impressive record, so I have to say nice job to my teammates! Head on over to the UT History section of the site to check it out! · It's been a long time since an update, mainly because I was away for 3 weeks on summer holidays. Things should start to roll again quite a bit faster. Dark Cloud 2 Review was just finished and can be found here. I just finally completed Metal Gear Solid 2 for the first time on PS2 and that review should be coming soon as well. Even after all this time you would think the graphics would be dated, but MGS2 still greatly impressed me, should prove to score high in the reviews (as if that wasn't to be expected). I also am planning to get started on the UT history section quite soon, so if any UT players are reading this, check back in awhile for 5 years worth of great memories, screenshots, stories and demo's.